That's right. CHIberia. It's ridiculously cold here in my corner of the world. Too cold. Hats off to those who are used to these -20, -30, -40 degree temperatures. So it seems only fitting to share a soup recipe today. Not to mention, brats are a popular Superbowl food around here. If you're looking for something warm to serve up for the Superbowl, this soup works well even in a crockpot. After preparing the soup on the stovetop in advance, you can transfer this to a slow cooker to keep warm during your Superbowl party. In small saucepan, boil potatoes til tender, drain, set aside. Meanwhile, in a large dutch oven set over medium heat, melt butter. Add onion, carrot and garlic; reduce heat to medium-low. Cook, stirring frequently, for about 10-15 minutes, or until onion is very soft and golden brown. Sprinkle the flour over the softened onion mixture and whisk until absorbed into the pot. Slowly whisk in the broth. Add the half & half and black pepper. Cook over medium heat for a few minutes until thickened, stirring frequently. Once thickened, reduce heat to low and stir in the mustard, horseradish and cheese. Continue to stir over low heat until cheese melts - do not boil. Stir in the cooked and sliced bratwurst, cooked potatoes and 12 oz beer. Allow everything to get heated through over low heat. If you want to thin down the soup, add a little beer until its as thin as desired. 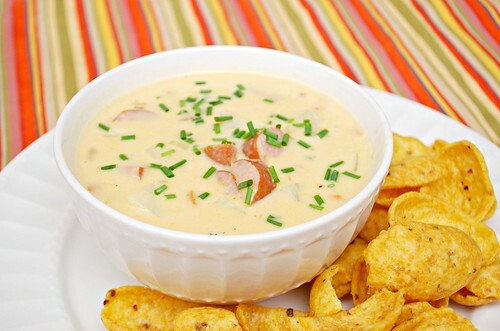 We're expecting to be snowed in today and tomorrow and this soup would be perfect to make! It's snowing here and this would be amazing for dinner tonight! Oh man, my husband would flip for this soup! Looks so good! 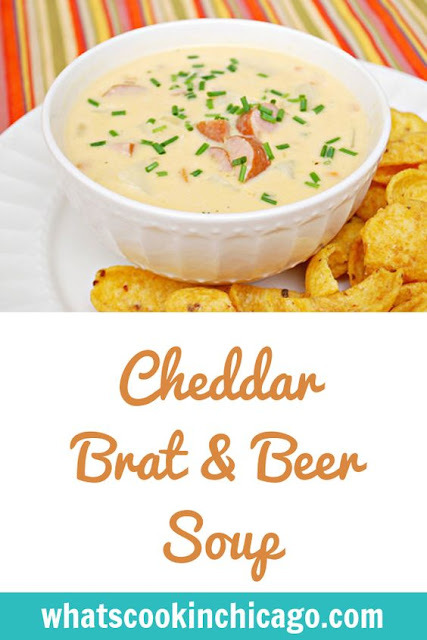 I made a beer and cheese soup a few weeks ago (much to my disdain for the taste of beer)...and I loved it! I'm barely surviving our teen weather here, I don't know how you do it with the negative degrees. However a big bowl if this soup certainly helps!